Thank you for taking such long time to answer Geoffrey. But my purpose was not to say that your price point was unjustified. Again, I just mean that, imo, you can't tell to everyone that saving money for months (or years ?) to but a luxury coat would be a good investment. It's definitely not. It depends on people standard of leaving, as you clearly explained in your post. And, I'm sorry, but the the math are truly simple for me: it is what I earn vs what producers/artisans are asking for their quality stuff. If I want to support hard working people and pay the true price of everything (food, furniture, clothing etc...) I won't have a roof over my head anymore. But I prefer to have a roof and pay quality food for my family and I than to have a luxury coat. Well then you've kind of sealed your own argument; this particular luxury is, quite simply, unaffordable for you. This does not mean Geoffrey's clothes are not a good investment. I think you have focused too much on the fact he made a slight generalisation (or, more precisely, an assumption of the social/economic status of the majority of readers of this forum) when he said it would be worth saving up for. I dont think you understand Geoffrey position very well. Since I know him personally and we have spoken at length about the craft and his approach, when I have the time i will explain it to you in better detail. Geoffrey approach to his work is not to see his work and making clothing as divorced from different aspects and industries of the world. He sees it as connected to and intertwined with the very structure of society in one form or another. He sees and bears the weight of his responsibility in creating (or at the very least preserving what is left of) a humane and dignified approach to living and respecting fellow human beings. 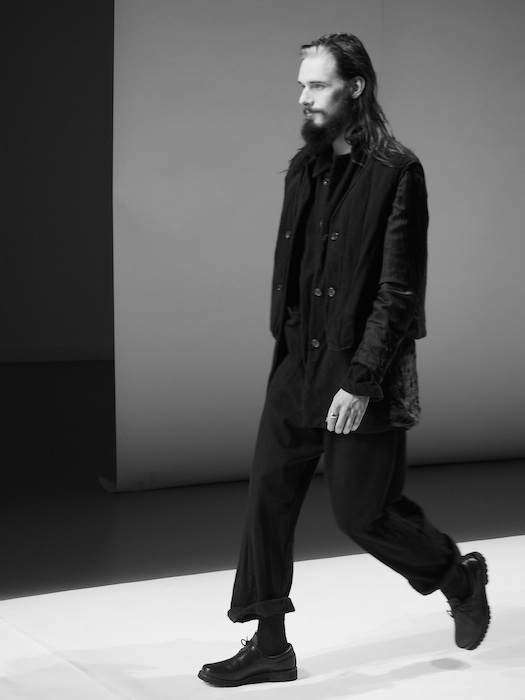 He is saying is returning and sticking to a more natural way of making clothing (among other things) is better for himself, the environment and human beings in general. because he us not participating in a system that misuses and abuses the worlds resources to provide cheap stuff in order to enrich himself. His work is made purely by the Skill and knowledge of himself and the people around him rather than searching the Globe for the next cheapest venue to produce items in the name of higher profit margins. "Act only according to that maxim whereby you can, at the same time, will that it should become a universal law"
Last edited by zamb; 01-05-2015 at 04:53 PM. Regarding Noumenos' problem, from a consumer's perspective, buying second hand could be a good for maintaining both quality of life and ethics. First let me express my deep sadness and concern over the events in France in the last few days, we have refrained from posting for awhile in respect of all the people and what has been going on. To Zam, thanks as always for your help and kind words in trying to sort out this matter with Noumenos. The feeling is of course mutual on my part for you, and I do feel as though there is far less to disagree about than he or she appears to feel. I am a bit saddened that he/she feels a need to state in a post that he or she does not respect me, but I think perhaps if we had a chance to meet face to face and simply talk in person there would not be such an issue. And though I do not know who he or she is, what he or she does for work/income, nor anything else about his or her situation, I will still try to maintain my respect for his or her opinion and situation and say so here as such. Noumenos seems to want do things for ethical and sustainable living and so do I, so what is most important is for us each to do our part and keep the movement going. … I think if noumenos really looks reads and listens to what I have to say, in particular at my first post to Johnny (#459) for example, he or she will find that the first thing I have always strongly suggested to those who cannot afford to buy our work like Old stated, is that the best solution is in fact, buying and using recycle vintage or used clothing. It is by far and away the best sustainability action for concerned consumers; and in many ways, what we are simply trying to recreate and bring back now for a new age where that level of quality and clothing and skill is disappearing. Second, I think I make it quite clear that I too support purchasing from Zam Barrett and others trying to do similar things- i.e.making clothes for people independently in their way with their resources and their communities. In fact, if Noumenos really knew my record, he or she would know that not only did we revolutionize avant-garde fashion in the 1990's by pioneering recycle design with used clothing at the Paris designer level, we did it with the lowest-priced Paris designer collection in the circuit for almost a decade. Our average retail price for our pieces was under 100 US dollars and we produced, sold and shipped over 10,000 individual pieces of them around the world from our 115 Kingston Street Ateliers in Boston Massachussets, so we know a lot about lower prices and what it entails and what it really costs. And I have also spent decades supporting and greatly assisting the launching of dozens of independent designers trying to break through and get a start in this part of the industry…including more than 65 independent designers from Europe, Asia and North America who presented over 191 individual collection presentations in Paris to the international fashion industry at the highest creative levels (and the lowest exhibition costs because we took no commissions and no profit above cost to any our colleagues) from 2003-2010 at the Area Paris and Area Private exhibitions which I founded and organized…. many of whom have threads on them here on SZ today, and many many others who have become the best practicing tailors or designers in their cities or their communities. But I really do not have the time right now to go on about this forever here on this thread and would prefer to get on with showing some our new works instead to other SZ readers who appreciate them and what they really stand for. All the best on your Presentation my Friend! I will certainly miss it but i am staying put in New York this season! All the best and Blessings to you and the team! I didn't get to read what Noumenos wrote prior to deletion, but regardless if any reader agrees or disagrees with Geoffrey's approach to design and fashion as a whole (along with the connected social commentary), I have to applaud his willingness to continue a dialogue with every individual in this thread. Going so far as to offer a personal invitation to his Paris showing as part of this ongoing effort to continue the conversation is quite respectable. All the best in Paris Geoffrey! One of these days I hope our paths will cross! Oh man, so many fantastic looks. It's hard to pick a favorite. That last one posted above is especially strong, but I also love the look with the patchwork trousers. I hope those cropped trousers come in a black! It was a great collection, probably Geoffrey's best in my opinion even though unfortunately I wasn't able to see it in the showroom. The presentation was also beautiful, very sentimental just like you'd except from the maestro. I tried to capture the mood in the photos but its of course impossible. 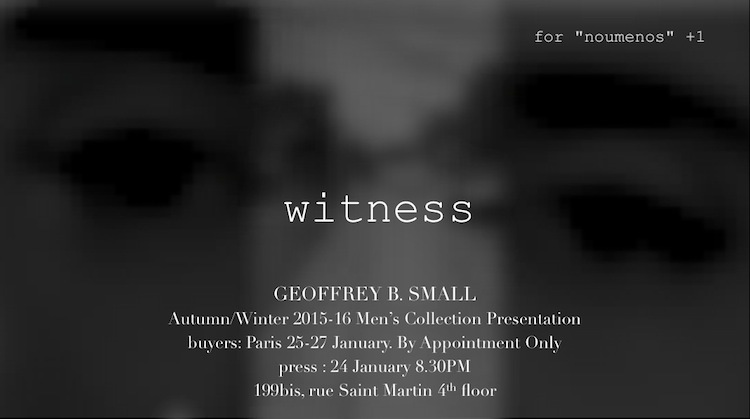 Hopefully Geoffrey will have time later to talk about the collection and the show a bit! I was deeply impressed by lowrey's photos and of course by the collection itself. I love how Geoffrey is able to deliver his idea to the spectator, no one in my opinion is able to do it better than him. Jackets, coats, shirts, pants are close to perfection in my world and perception of fashion. Thank you for making me able to look at it! I need to handle those clothes... Every picture is great but, at the same time, it seems like the best part is in the details. Is there any possibility to see this irl? 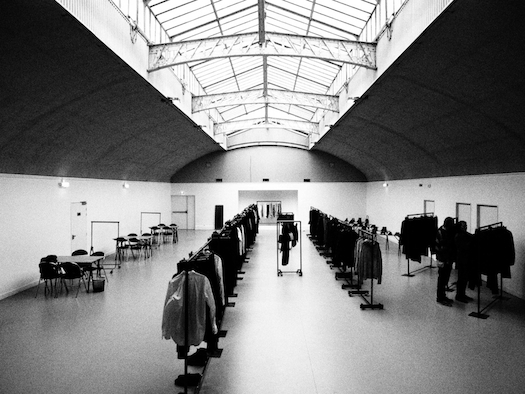 First, let me say thank you to everyone here for your kind words and comments regarding our show, and thank you Faust, Lowrey and SZmag for the beautiful images that you took and posted… And of course, a very warm and heartfelt thank you to everyone who came and shared in our 90th collection presentation session in Paris this week. From our remarkable "Witness" show to our new expanded showroom presentation in the legendary Salle Philae of the Espace Saint Martin. it was truly a pleasure to see and work with each and everyone of our guests, clients, collaboration partners, and of course our dedicated GBS Paris team members on a wonderful and beautiful experience in designer clothing presentations at the world's highest independent levels. We look forward to continuing to build the dream together with each and every one of you, wherever you are. 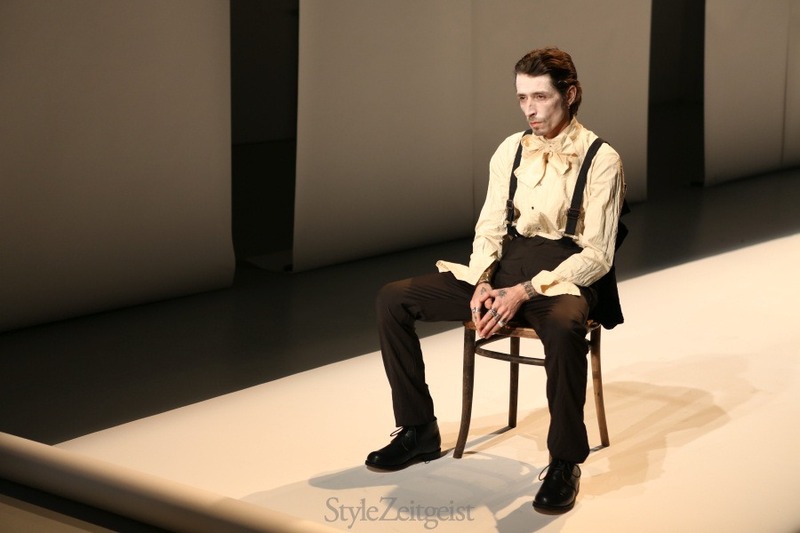 (photos of Bertold and the showroom courtesy Yusuke Shiiki, Japan. here is the unlisted Youtube link for SZer's, hope you enjoy viewing it as much as we had being there and putting it on…. Love your work mister Small. The pieces in this video look gorgeous. The way the shape themselves on the bodies and the subtle textures are wonderful. Especially the shirt (?) with concealed buttons has me mesmerized - it's almost like it tricks the eye, looking both light and heavy at once. Would love to see these in person some day - obviously seeing them on a computer screen is not quite the same as the tactile experience.